I've had friends who've seen my kitchen pantry tell me I could operate a small foreign food mart from my house. I love picking up food stuff when traveling and my friends know me well to the point they buy me more food stuff too, which is why my stash of goods keeps growing. The awesome Christine noons from the States who knows of my love for Sriracha and is just too generous as usual! 누나 고마워!!! I'll let you know whether I preferred the popcorn or the chips in Sriracha form! And a whole slew of goods from the States courtesy of my parents. A balance of indulgences (Cheez-It, corn nuts, etc) with some healthier options (chia seeds, nuts, natural energy bars) and a good amount of cheeeeeeeeeeeeeeeses. Ah love, thy name is food. Thank you everyone for the ish and I look forward to trying them all out soon (many of which I've already gotten a head start on). Will have to share the love with my friends here in Korea too! After another dreary winter season, these sort of things really puts a spring in my step! (Pun intended). On a rather sudden note a month or so ago, my parents notified me that they would be coming to Korea in early spring! I had been expecting my dad and grandma to come for some business-related stuff but having my mom come too was an unexpected but happy surprise! If you noticed the blog has been quiet the last few weeks it's because I've been busy wandering around and hanging out with them- in addition to a long list of old and new friends who seemed to have all come through Korea in the last few weeks, one after the other. As for my parents and my grandmas, we took a special road trip down together for 5 days hitting up Cheonan (where one of my aunt and her family resides), Gongju, Gochang, Hadong, and Tongyeong (yes, Tongyeong, again). My maternal grandmother could only join us for the first two days but was good to have my other grandma journey with us all the way! Before I set off for college, our family used to go on road trips every year- from coast to coast, to Canada, the South, and more. Doing another road trip, after so many years, was a blast of a flashback that was, admittedly at times, tiring but still filled with many good memories. Too bad my studious little brother and sister couldn't join us this round but we'll have to remedy that soon. We certainly missed you Eds and Danbi! In between, there was a lot of good and interesting eats. We partook in some local delicacies and special dishes that aren't found elsewhere such as ground mitten crab soup in Hadong, flounder mugwort soup in Tongyeong, and mung bean seafood pancakes (as opposed to flour-based seafood pancakes) in Gochang, and much more. I'll be sure to do a separate travel musing post on all those eats (hopefully) soon. I say hopefully as I'm still almost six months late on my travel musings posts from Thailand alone, so I'm considerably backlogged on postings (though I've meticulously documented them!). Sorry! As for the traveling, it was really beautiful in so many ways. We just so happened to be traveling around when spring was just about in its full glory so just about everywhere you looked, the scenery was bursting with life and color. When you're living in Seoul and mostly traveling to only other major cities here, it's easy to forget that there's much more to Korea beyond bland apartment buildings and flashing neon lights. 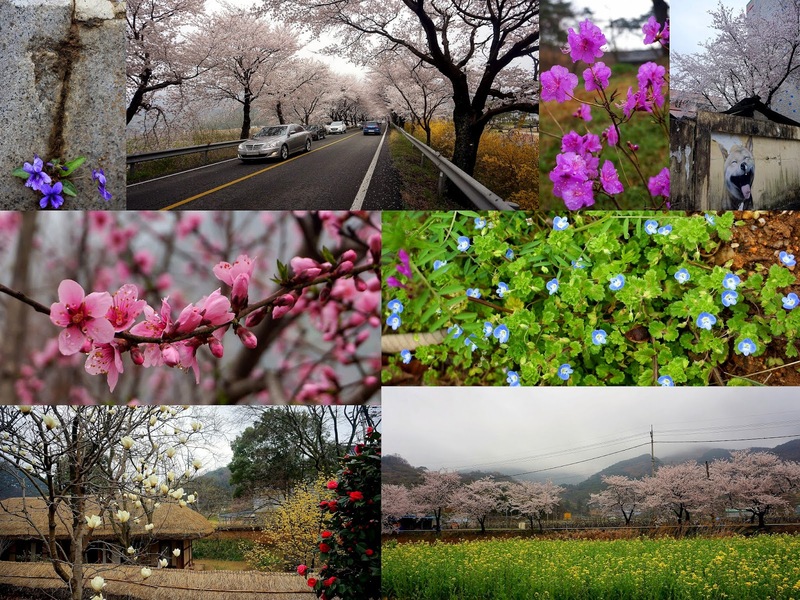 If you ever have the opportunity to go about the more dormant and slower paced areas of Korea, don't hesitate and do so! I'm officially at the point where even the imminent arrival of that little ol' thing called a "birthday" no longer evokes from me a festive or even celebratory mood but simply a ho-hum, nonchalant neutrality. On the other hand, I'm not sure if it's all the baby pictures from friends and peers (which, I'm pretty sure, makes up about a good half of my daily updates) or the actual time spent around some of the kids and babies of my friends around me, that's making me reflect more on life, health, and all those generic scary future "adult" terms as I get older. If, God willing, I do have kids one day, I want to make sure I'm in top condition (physically, mentally, financially, spiritually, etc) to give my all for my future kids. Haphazardly just "going with the flow" and "winging it" do not seem to, unfortunately, cut it anymore even if it's a strategy that hasn't failed me (sort of) worked out for me for a good chunk of my "adult years". My friend's nephew "wool-chan" who I am tempted to kidnap every time I see him. Being a planner and, more importantly, sticking to plans, for instance, has never been my forte but I'm realizing that unlike changes and adaptations that were mostly sparked internally while I was growing up, I'm having to now make a lot of changes and adaptations (including making plans) that are a result of external forces and circumstances in life. I've been resistant to accepting personal changes for years now but this upcoming birthday has pretty much surrendered me to that thought. Flowing on from this epiphany is the realization that a lot of self changes and improvements requires me to step out of my comfort zone, personality, insecurities, and more. So with all that, I'm pushing myself to think and approach many areas of my life in new and different ways. No doubt, doing so may result in some hits, misses, and failures but if anything, I'm hoping they will at least be some glorious and spectacular hits, misses, and failures, that I can learn and improve upon. So thank you always, to my loved ones, for your encouragement and support. Keep pushing and challenging me while being patient for any occasional slips that may come about. As Mr. Will Smith so eloquently put it in the all-time classic movie Bad Boys II (just a rung below White Chicks), "We ride together... we die together. Bad boys for life." And who do you know is a badder boy to ride together with than this stud? 28, I'm comin for you! Could this device end obesity forever? Teff - Ethiopia’s tiny secret going global. The next big thing after quinoa? Happy early (?) birthday! I hope you enjoy all that life has to offer you in the upcoming year!